This past weekend, I had the chance to spend a few days at my parent’s home. Their home is one of my favorite places ever- it is comfy, cozy and always filled with good conversation and great food. Wrapped up in this weekend was a trip to Ikea, awesome meals, fellowship with some great friends, and most importantly a celebration of my sweet Mom’s birthday. Since we live 3+ hours away from any family, we savor each moment we get to spend with them. I was so so excited to find out that a rare 3 day weekend off of work would fall on my Mom’s birthday weekend, so I jumped at the chance to head home (Josh had to stay back in Santa Cruz for work, boo). Throughout the weekend, my Mom and I had an ongoing conversation about how the “normal” tasks of the past (like homemaking, sewing, cooking, growing a vegetable garden, preserving foods, etc.) are being forgotten by my generation. I’m not sure where the disconnect is, whether if it’s the failure of the previous generation(s) to pass these skills down, the implementation of “convenience” food and technology, or if it’s the lack of motivation or interest from my age group. Whatever it is, I desire to be different. I know I’m not alone in this, as some of my friends are pursing the same things…hooray!. My hope and goal is to glean as much knowledge from women (and men too) in my life while I can, because tradition and these skills are indispensable. 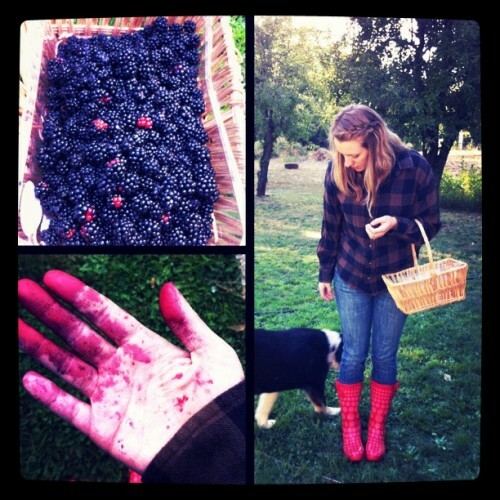 With these thoughts in mind, my Mom and I spent a few hours picking blackberries on their property. It’s a bumper year for their blackberry crop, so I donned a flannel from my dad’s closet and some rubber boots to combat the thorns. While my mom stuck to harvesting the berries on the fringe, I dove right in (I still have scratches to prove it…). We had a blast and came away with a ton of berries! I’m realizing that food preservation (canning) is one of the lost traditions that I was talking about. My Mom, Aunt & Grandma have canned for years, so I have some very wise women to learn from. Enter: tons of blackberries. The morning after we picked, my Mom spent a couple of hours teaching me the art of creating blackberry jam. I’ve watched her can different things my entire life and have helped quite a few times (like when we canned a million jars for my wedding- seen over here). But I’ve never done the majority of the process myself. Come to find out, it’s easy. REALLY easy. And so fulfilling knowing that you are carrying on a tradition and skill that most have forgotten. In a saucepan, cook the berries, sugar and lemon juice on high for 5 minutes, reduce heat and cook for 15 minutes more. Skim off foam. While jam is cooking, heat jars, lids & rings in warm water (my mom showed me a trick of heating these in the same pot- just set the lids & rings upside down on top of the jars in the pot- no need to use multiple pots!) Your lids are ready when the rubber seal is soft. Pull a jar, lid & ring out of the warm water and fill with your jam- leaving about 1/4 inch of space at the top. Bring water to a boil and boil for 10 minutes exactly. Remove jars from water and let sit on the counter. You’ll hear a “pop” of the lids indicating that they are sealed. Jam will thicken up as it cools. Canning is easy (or at least this batch was!) And there are some pretty amazing tools out there to make it even easier. My mom recently bought a Ball utensil kit (like this one) and it made a world of difference for the process. My Mom also told me that she’s always kind of been intimidated by the canning process because she thought she needed to do a huge batch to make it worth while. Not true! She realized (after 30+ years of canning) that she can do a small batch in a large soup pot….no canning kettle needed! We did 7 jars and it was a breeze! I’m not sure what it is about learning these skills that so intrigues me, but I love it! I think it’s the thought that I’m continuing a tradition from the past. My Mom is a great resource and is so willing to teach me, it seems like it would be a waste if I didn’t pursue it!